Enjoy the fun of camping in these dome tents, in the midst of the fresh, clean mountain air, and views of rolling hills all around. You'll enjoy all day in these green environs, and at night, you'll gather around a crackling bonfire to savour hot soup before dinner. Take advantage of the location to trek to nearby Chandrashila Peak, Deoriatal, Tungnath temple, and the many temples around. This cosy campsite is located about 2 kms from the main Chopta market, away from the crowds, but close enough that you can get there easily. It is an eco-friendly resort, using solar power for its needs, and stunning views all around. On clear days, you'll be able to see snowy peaks in the distance and can choose to go trekking on the numerous nature trails around (you'll have to pay an extra cost to hire a guide). You'll be staying in cosy twin-sharing dome tents, equipped with sleeping bags, and mattresses. There are fun on-camp games like volleball, badminton, etc to keep you busy, but you might not be able to tear yourself away from the views! 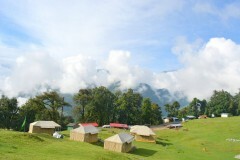 • Book a night of dome tent camping in Chopta. • Enjoy a day of activities like badminton, nature walks, or just relax at camp. • Trek to nearby spots like Chandrashila, Deoriatal, or Tungnath (at an extra cost). 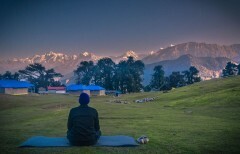 If you have asthma, heart conditions, or spinal or knee problems, it is recommended that you consult your doctor before booking this Chopta camping adventure. Consuming alcohol is prohibited before adventure activities. 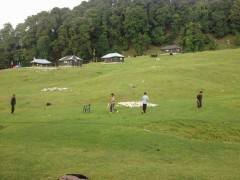 You must stick with your group at all times during this Chopta camping trip. You must adhere to the instructions of the trek/activity leader at all times. Please avoid causing disturbance to any other campers. You may be asked to leave the Chopta campsite if other campers complain. There will be no refunds in this case. 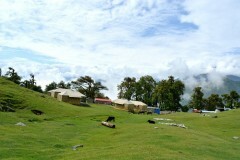 For cancellations made 0-5 days before check-in to this Chopta campsite: No refund. For cancellations made 5-10 days before check-in to this Chopta campsite: 50% of the trip cost will be deducted. For cancellations made 30-10 days before check-in to this Chopta campsite: 25% of the trip cost will be deducted. For cancellations made 30-45 days before check-in to this Chopta campsite: 10% of the trip cost will be deducted. For cancellations made 45 days or more before check-in to this Chopta campsite: No charge. All refunds will be made after deducting transaction charges. 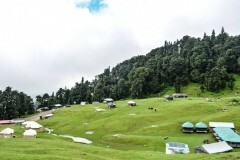 Camping at Chopta is arranged considering normal weather. In case of cancellation of any event due to reasons beyond control such as natural calamities, riots, political uncertainty, public transport failure etc, refund shall be payable with respect to the given refund policy. Children below 5 years stay for free. Children between 5-12 years will be charged INR 1300. Over 12 years or extra adult in room will be charged as per adult charges. Today you can check in to the campsite anytime after noon. You'll be shown to your dome tent and can unpack and relax. After that, you can go on a nature hike through pine forests, or play a game of badminton or volleyball at camp. In the evening, as the sun goes down, a bonfire is lit and hot soup is served. You'll spend the evening under the stars and then it's time for dinner. Overnight in dome tent. Today you wake up in your cosy tent and step outside to take in the views of mountains around. You can do some yoga or meditate here, or go for a morning walk. After that, you'll dig in to a big breakfast. It's time to say goodbye shortly afterwards. Your Chopta camping trip ends here. You'll check in at 14:00 hrs, and will be shown to your dome tent on twin-sharing basis. Each tent is equipped with sleeping bags and mattresses. You'll have access to common toilets for your convenience. You'll be served evening tea, and later will enjoy a hot cup of soup during the bonfire. Dinner consists of rice, chapati, dal, mixed vegetables, papad, pickle, and salad. At night, you'll go to sleep in your cosy tent. Today you'll wake up to a cool misty morning, and can try some yoga or meditation in the fresh air. Breakfast consists of aloo paratha/roti and vegetable/boiled egg/poori-chole/chole-bhature/bread and jam, and more tea or coffee. Take a walk after breakfast, and then it's time to pack up. You will need to check out by 09:00 hrs. Your Chopta camping trip ends here. 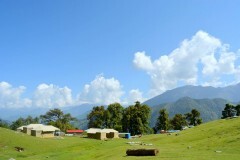 This campsite is located 2 kms from the main Chopta market, just off the Ukhimath-Gopeshwar road. It is about 200 kms from Rishikesh, and 245 kms from Dehradun. The closest airport is Jolly Grant in Dehradun (about 245 kms away).